Pink Studio has packed all the vintage style of the hit advertising drama Mad Men into this stylish Larissa clutch. Some might call it drab, but after seeing so many colorful Pink Studio designs I'm happy for something a little more conservative. The look of black houndstooth checks against the silvery background is so elegant, and versatile enough to suit any occasion. 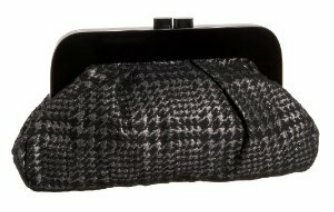 The houndstooth checks really make this design, as we've seen so many similar frame purses before. It's a matter of personal taste whether you see this approach as uninspired or classic. Personally, the Larissa's vintage charms make me forgive any lack of originality. Pink Studios follows the vintage style to the letter, so there is no chain strap as we've come to expect from contemporary purses. The Larissa is small enough that this isn't a real problem, at least until the canapés tray comes around! But practicality isn't forgotten entirely; the zippered pocket inside is much more useful than the tiny open pouches we typically see. At $69 the Larissa is a bit more expensive than I'd expect a fabric purse to be, but its evergreen good looks help to justify the splurge. The Jesse B. Collection Bermuda bag, a great alternative to this houndstooth bag.